This is a quick reference guide of the formats best suited to transfer data into Kingdom. To transfer data from a Kingdom database, see Insight and Kingdom Overview. Note: This guide is given in “good faith”, information here is based on experience from our users. You may still need to edit your files between software. In general, we recommend exporting horizons from Insight as X/Y/TWT grids and importing them into Kingdom as a grid. You can then use Kingdom's Grid to Horizon feature to convert these grids to editable horizons. 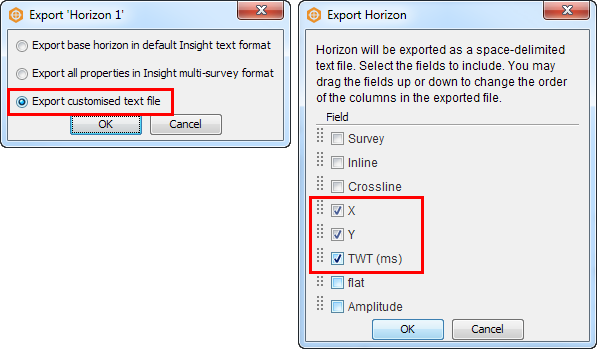 To export horizons for import into Kingdom, select Export customised text file when importing from Insight and export X, Y, TWT/TVD. The reason for the enhanced difficulty is due to the fact that Insight handles 2D data in relation to CMPs, where as Kingdom handles 2D data in relation to SPs. 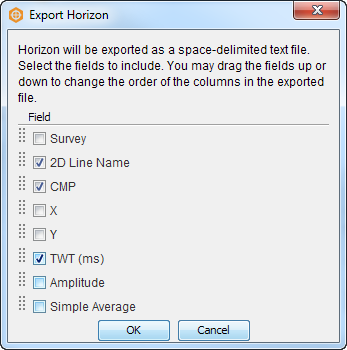 Export your Insight horizons as a customised text file with the following format: 2D Line Name, CMP, TWT. If you are sure of the SP–CMP relationship, you could then edit this file (in MS Excel or likewise), changing the CMPs to equivalent SPs, and then import into Kingdom directly as a horizon using the format 2D Line name, Trace (SP), TWT. The horizon interpretation data should then be located directly on to the corresponding 2D Survey in Kingdom (assuming all line names are the same). At the Import fault surface dialog in Kingdom, specify these as Assigned Fault Lines in a Named Fault and choose the input format GeoQuest IESX v.11, and then assign them to a survey. Unassigned fault sticks are also exported from Insight in Geoquest/IESX format and can subsequently be imported to Kingdom in a similar way. At the Import fault surface dialog in Kingdom, specify that these are Unassigned Fault Lines and choose the input format GeoQuest IESX v.10.x, and assign them to a particular survey. Note: Insight operates in XY space. This can cause problems importing 2D faults as Kingdom requires 2D survey data that is not available in Insight. 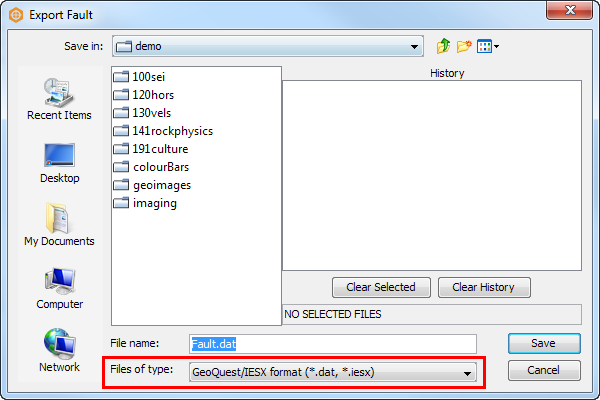 The best way to get around this is to create a dummy 3D survey in Kingdom and import the faults as Geoquest IESX V10.